Enter the code SHRIMPSTR at checkout. 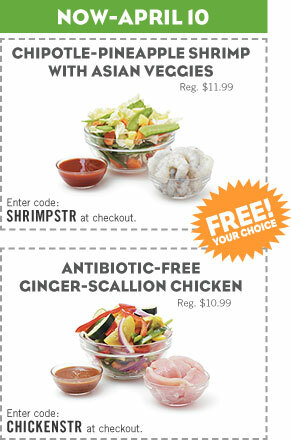 Enter the code CHICKENSTR at checkout. NOTE: Once again, these codes are inferior to SHRIMPFRY and CHKNSTRFRY which require no minimum order amount. But, if you’re trying to double up on freebies, you can try using the additional codes. Now through 4/18, enter LAMINITA for a free lb of Costa Rican La Minita coffee.